The final two, absolutely amazing Invitational entries than more than make up for their late delivery. 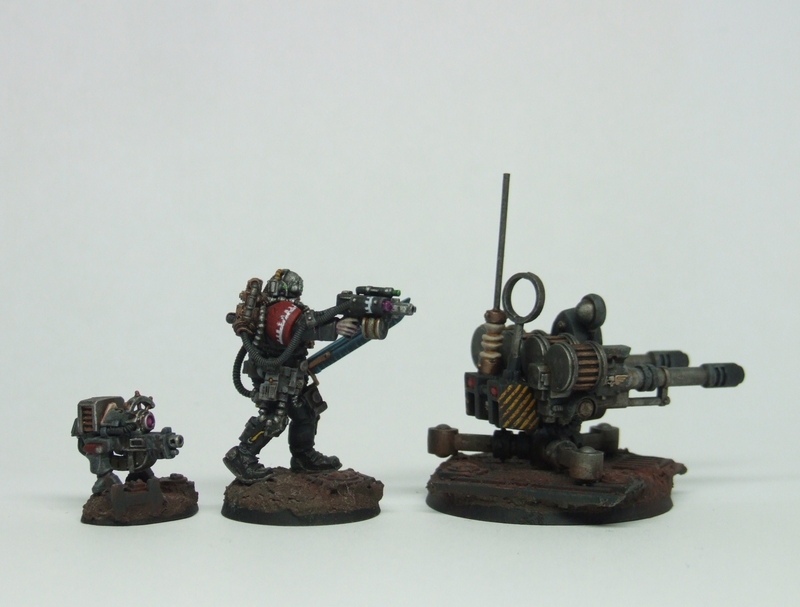 First one is from PDH, a weapons team symbolic of his incredibly detailed, tasteful and reserved style. I started off with the Invitational with the idea of simply wanting to continue the army (ha ha)/Inquisitor NPC’s that I have been building for a while. So there was a merc, a skitarii and a “weapons team”. I also made a little gun dog to go on the base of the Skitarii to represent a boltgun. The group were ok but something was a little off for the Invitational. I only realised what was off when taking the black and white photograph – I had two models of similar stature, who both should have been on 25mm bases. So in the spirit of the Invitational I removed the merc* from the line up as he didn’t really fit with the Mechanicum theme and found a gorka morka base for the gun dog. Now I have three models of different stature and movement. Painting has gone well now that I have gotten used to my new glasses (yep really bad timing). I’m really happy with the paint job, especially the skitarii’s face and shoulder pads, the free hand stripes and cog symbols were fun to do and really make the mini so much more interesting. Surprisingly I think pink/purple bionic lenses work really well on these grey models and complement the green lenses rather nicely. Thanks guys. You have really made a brilliant start to your shared blog and its getting better and better. Glad to see you finaly end it Peter ! Very nice team in here ! And the gun-pet is awesome ! It’s always a pleasure to see new minis from PDH. He’s the master when it comes to understated brilliance. Fantastic looking group! The drab and dusty paint scheme fits the models perfectly. I really love how you painted the caution stripes, thin and dark. I am glad you found a Gorkamorka base for the gun dog; the little construct looks great as a separate model. Excellent looking models, and some of my favorites from the Invitational! I really like the dusty weathered look you achieved. The addition of some purple works surprisingly well too, along with the reserved use for red. You really did a stellar job with his shoulder pads and the hazard stripes on the weapon system. 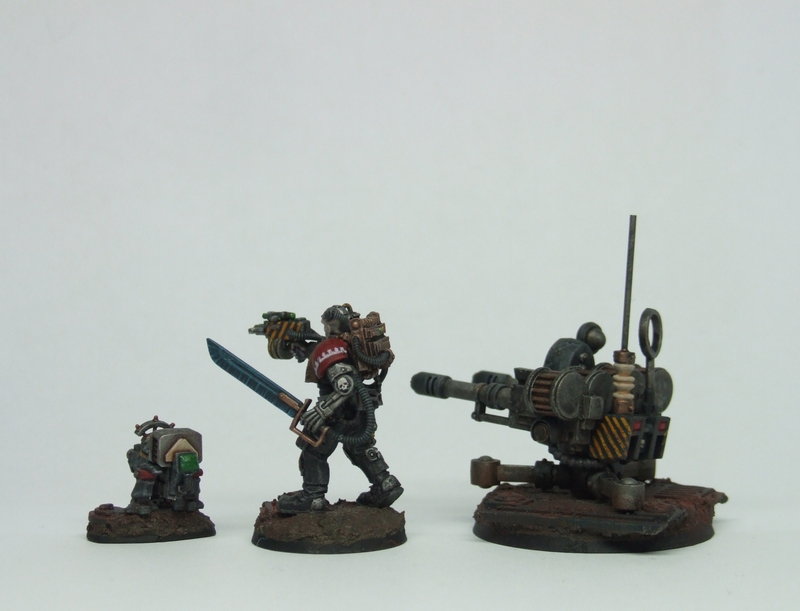 I am glad you put the gun dog on a separate base; I feel he slightly cluttered the skatarii before, and he really deserves a base by himself. The use of a Gorkamorka one is perfect; it really brings back memories! I think you really nailed the skatarii’s pose as well; he has a very reserved, yet powerful pose. The steady, sure advance, with his archeopistol held out in a confident way, head slightly cocked as he lines up the sights. Lovely. All hail the gun puppy! Beautiful work as always Pete. I really like your more robust and warrior like take on the skitarii. The gundog is my favorite though -he’s just the cutest little bolter ever. My laggard in crime…They are excellent Peter! I think the decision about bases and removing the Merc was a good one – it makes them look much more tight and as a coherent weapons team. The Skitariis pose and paint job is great. I love the shots from the backsides where you can see how he is moving. The Gun Dawg is perfect – Gorkamorka fits it well! late to the party myself.. well in replying.. elegant stuff mate.. the green and purple lighting is inspired..
A nice team here, the little gun walker is a cute touch, I can just imagine it’s “bark” is most certainly as bad a s it’s “bite”…. 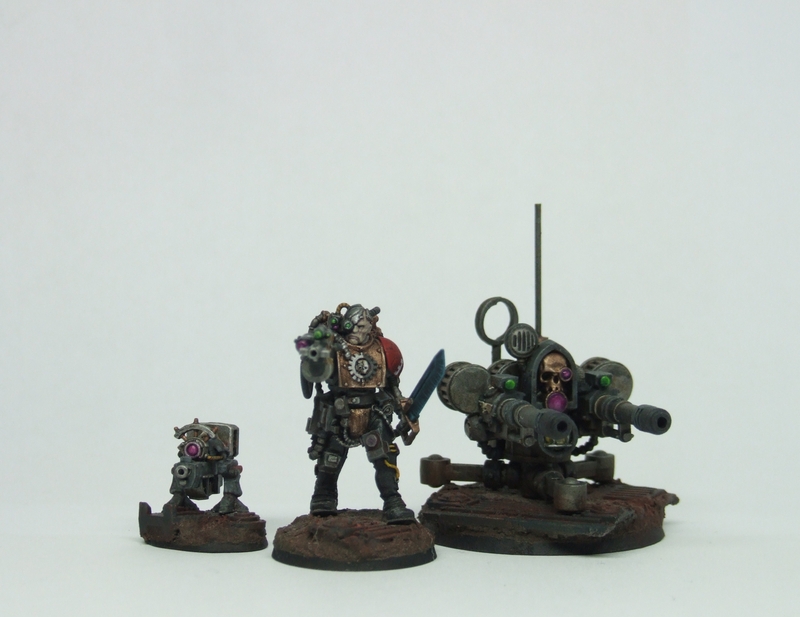 Next Post Vlka Fenryka ex Machina – Finished Kaerls and the Thrall pack is ready for primer.